Sometimes when bad things happen, good people come together to do great things. First responders acted swiftly to aid those injured during this terrible hurricane season and supported those who lost so much. Now, music’s superstars are joining in to raise money for 2017 Hurricane victims with the Trying to Reason Hurricane Relief Benefit Concert, taking place Sunday, Nov. 19 in Tallahassee, Florida. 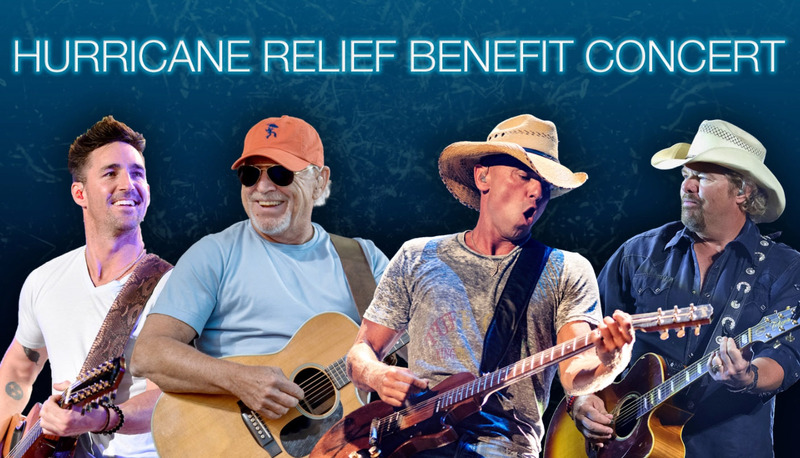 In this one-of-a-kind live performance, Jimmy Buffett, Kenny Chesney, Toby Keith, and The Coral Reefer Band will hit the stage alongside special guest Jake Owen as well as opening act Caroline Jones. This historic event sold out in 11 minutes, making it the fastest sell-out in Tucker Civic Center’s history. So, if you weren’t able to snag a pair of tickets, fear not! You can still hear the performance LIVE on SiriusXM’s Radio Margaritaville (Ch. 24) and No Shoes Radio (Ch. 57) starting 7:45 pm ET/4:45 pm PT.